I installed a half-inch marine plywood floor over two layers of 3/8 inch high density foam. The bottom layer of foam is just strips of foam placed in between the ridges of the metal floor of the van. Then I installed wood grained sheet vinyl over the plywood. I needed to balance competing design goals of high insulation value with maximized interior vertical height. 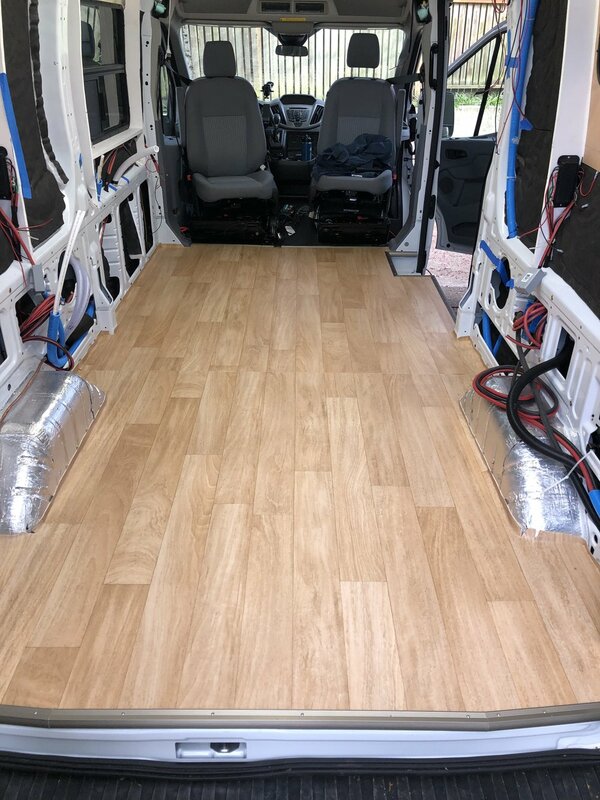 Although we will be living in the van full-time, most of our time will be spent in warmer climates, and for colder climates the Webasto heater will easily keep up with a moderately insulated van. 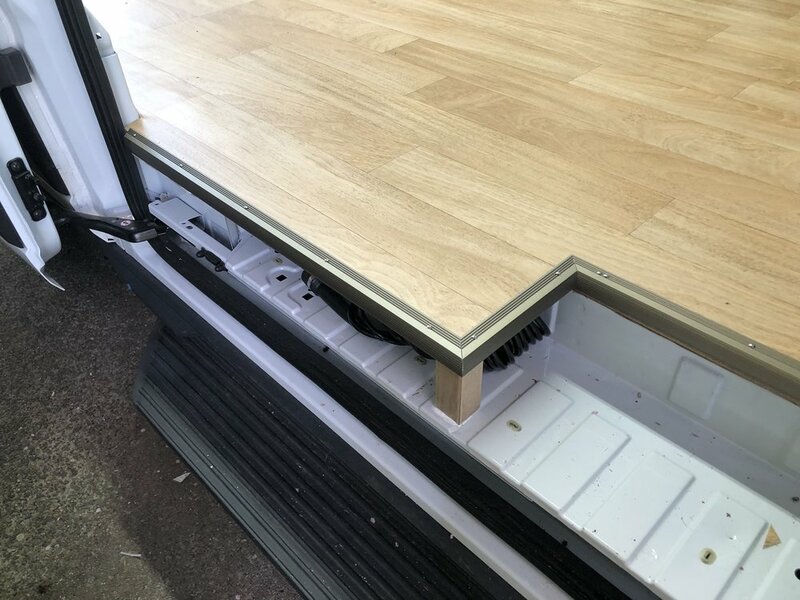 Each one inch of floor height decreased my total van storage capacity by about 3.5% - as I would need to reduce the height of my overhead cabinets and the garage storage area to retain sufficient clearance in the bed area. I used half-inch marine plywood because I wanted a decent level of support for the 350 pound water tank, the bench seat, galley, etc. Marine plywood does not expand or contract with temperature and humidity changes, is less than half the weight of typical plywood, and is very rot resistant. 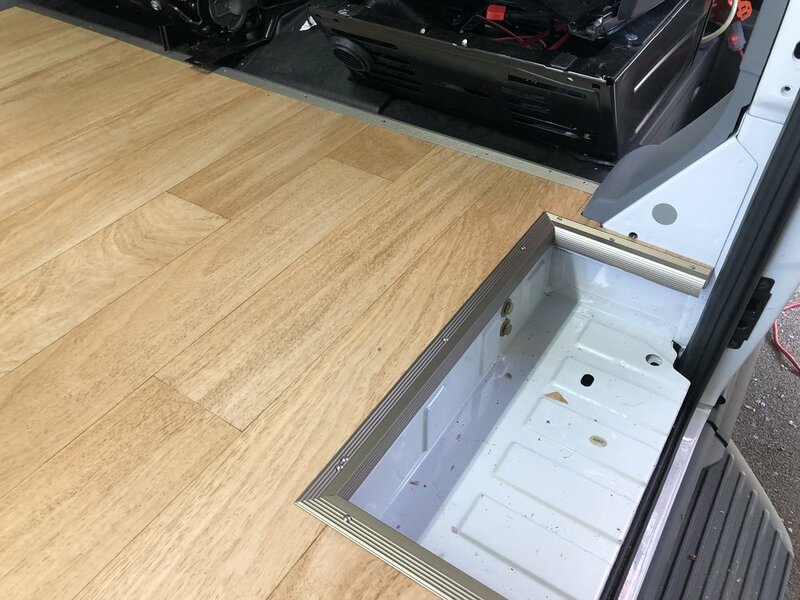 For fixtures which are bolted through the van floor, I placed one or two layers of 3/8 inch marine plywood underneath the top layer as blocking. I didn’t want to bolt through the foam as that would compress over time and create a loose installation. Turns out ¾” blocking is too short in the valleys, which is why I glued two pieces of 3/8” together instead. For fixtures that are screwed to the floor, I wanted to provide additional material for the screw to bite into, so blocking was placed wherever I thought I would be screwing something down. For anything that was through bolted, before I could install the floor I had to figure out exactly where I would be installing the fixture, create the appropriate mounting brackets, and drill the holes. This took a lot longer than the actual floor installation. I chose sheet vinyl to create an impermeable, durable, dimensionally stable surface. I coved the sheet vinyl ½” up the walls. In the event of a smaller spills (dripping kayak, wetsuits, raingear) or a major spill such as a water tank or drain failure, the water will hopefully drain out the back and side doors and not into the walls and floor of the van. 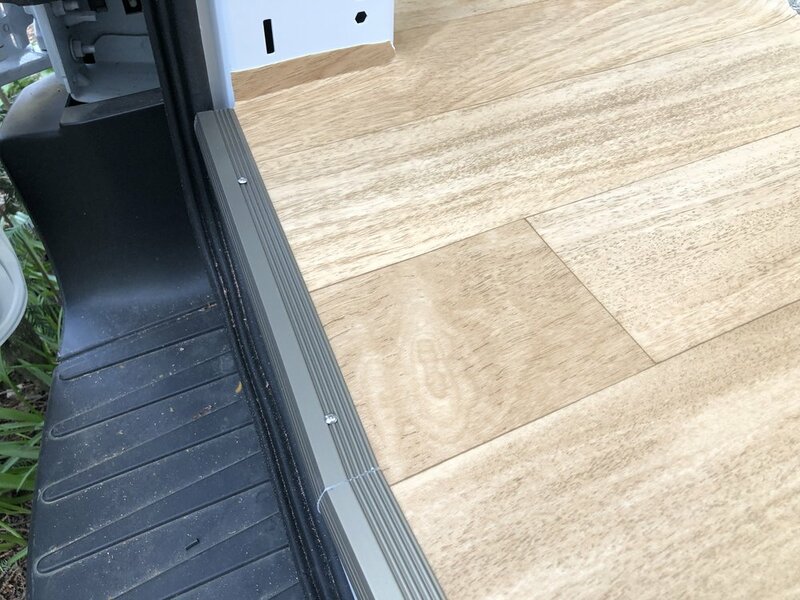 I narrowed the step by the sliding door to increase floor space, and installed an onboard air compressor underneath. Your choice of vinyl flooring. I put in Mohawk Danbury. 3 full sheets of cardboard for making the floor template. You could also use large boxes, but I don’t like the seems and floppiness. You can find full sheets for about $7 at a packaging supplier. Aluminum transition strip for the transition to the front cab. 15-20x 1” #8 SS flat head wood screws – to lightly fasten the ½” plywood to the blocking strips. Hook blades for cutting vinyl - makes it a lot easier to cut in place in the van. https://www.homedepot.com/p/Milwaukee-Hook-Utility-Blades-5-Pack-48-22-1932/203980994. Map out and drill holes for all fixture installation locations that are through bolted. This is necessary because once the floor is on, it is very difficult to figure out where to attach things that need to be bolted all the way through the floor. Do the same for any lighter weight fixtures that will only be screwed into the wood. Inverter: I will be securing the inverter with aluminum angle bolted to the walls and floor, but not through bolted. Two blocking strips were placed. 600 amp hour lithium battery bank: Total weight here is about 120 pounds, so I am through bolting battery strap brackets at the back and front of the bank. Two blocking strips replaced, one of which is shared with the freshwater tank. 350 pound freshwater tank: this is my heaviest load, and required the most fabrication and effort of all the fixtures. 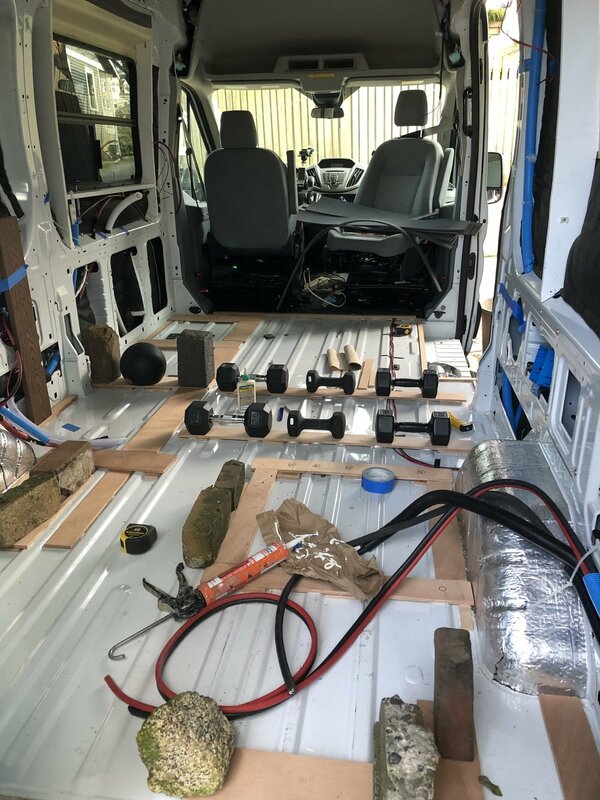 I fabricated two 3/16 inch steel brackets that span framing members underneath the van, and I am attaching them with a total of seven bolts through the floor to an interior metal frame. I ran blocking all around the perimeter edge of the water tank. Bench seat: my design has the bench seat back attached to the bed frame, and the seatbelts attached through the floor separately from the bench seat, so the bench seat itself is pretty lightweight. It is bolted through the floor with six bolts and 6 4x4 backing plates, with two blocking strips to support it. AC compressor: at 62 pounds, this is not a super heavy load to secure, and the space under the vehicle is pretty accessible, so I’ll be through bolting with quarter inch bolts later on during the compressor installation process. I did apply blocking in preparation. Bathroom cabinet: one blocking strip for the inside edge of the bathroom cabinet. It will not be through bolted. Galley cabinet: multiple blocking strips, galley is not through bolted. Place matching blocking strips on the ridge peaks, which gives you a total thickness of three quarters of an inch – the same thicknesses two layers of foam. I placed my blocking strips to spread out point loads for fixtures. Cut strips of 3/8 inch foam to go in the ridge valleys, and glue down with 3M 77 contact adhesive. I like 3M 70 because only one surface must be sprayed, so I sprayed the foam pieces and eliminated any overspray on the metal floor. Take pictures before putting on the next layer so that you know where the blocking, ridges and valleys are. Now cover the whole floor with a layer 3/8 inch foam, cutting out as necessary around blocking strips. No need to glue this layer. Take more pictures – so that you know exactly where the 2 layer blocking strips are – these are the best to screw into if you need to tie something to the floor. And if you don’t know you’re on top of a ridge, you’ll drive a screw right through the sheet metal. NOTE: Don’t forget to leave a hole for the spare tire winch. I divided the floor into three sections – garage area, galley area, and living area. I used 4 x 8 sheets of cardboard to make templates of each area starting at the back, then galley, and then living area. I used my scribing tool to come up with a fairly accurate final layout, and then penciled in adjustments where the scribing tool wasn’t accurate enough. I cut out the long straight sections with a circular saw, and the curved sections with a jigsaw. I left a ¼ inch gap all away around the perimeter of the floor, and a 1/8 inch gap between floor sections to eliminate any possibility of squeaking caused by wood rubbing on metal or wood walls. For the sliding door and back door, I planned on trimming it with aluminum bullnose, so I brought the plywood out to within ¾” of the doors when closed – leaving enough room for the bullnose and any plywood facing I attach to the doors. 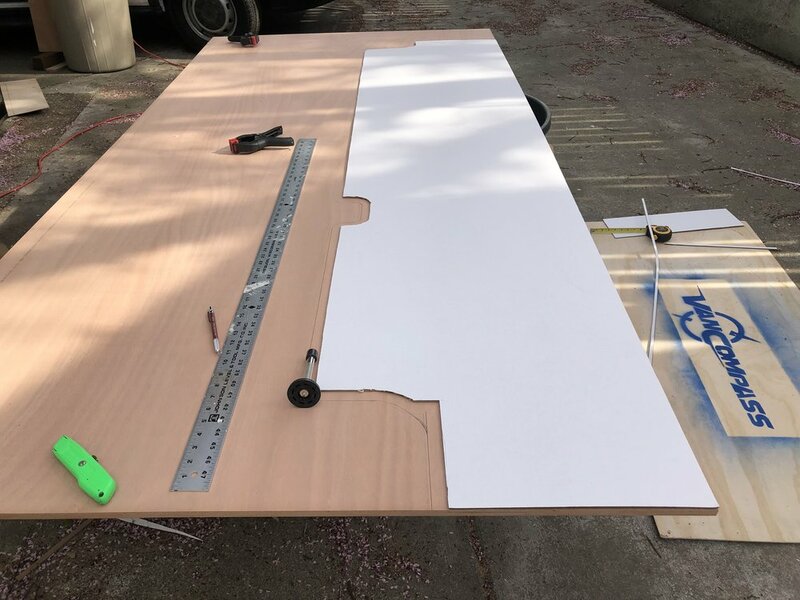 For the back door, rather than trying to match the curve, I just sketched 3 lines on my cardboard template – one long one in the center, and two shorter 12” segments on either side. I didn’t need the wide step by the slider, so reclaimed part of that area as available floor space. My step ended up being about 18 inches wide. To support the overhang, I put a piece of 2x2 hardwood under the corner, glued the bottom down with 5200, and put a hefty screw into the top. The face of the cubby underneath will be trimmed out with wood later, using velcro for each access to the compressor. Do the final install of the back piece of plywood. Place 4-6 screws into the blocking along the rear doors and a few along other edges. Continue with the galley piece, and then finally with the living area piece. Sheet vinyl is typically sold in 12-13’ widths with the pattern running lengthwise. 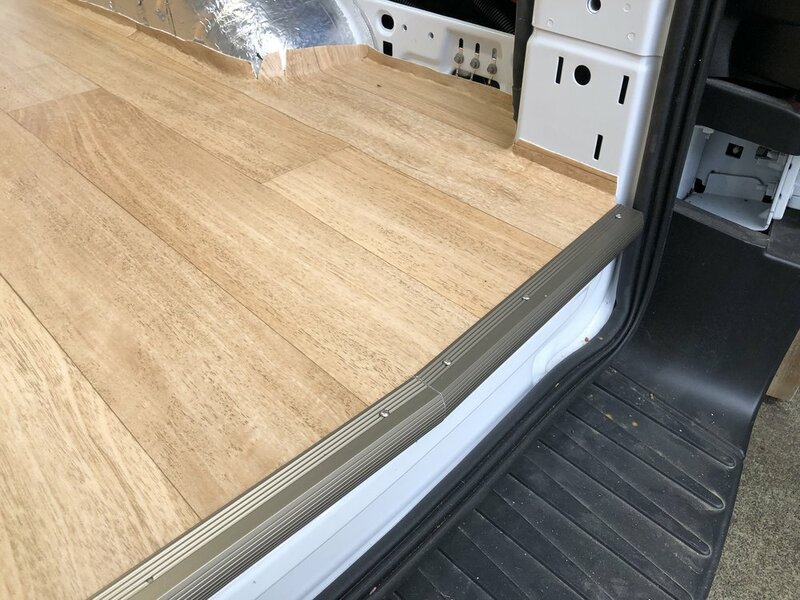 I wanted my wood grain pattern to run the length of the van, so rather than buy a full 11’ long by 12’ wide contiguous piece of vinyl (and throw half of it away), I opted for having a seam in the middle. This allows me to run the wood grain lengthwise while buying only 6’ of length. The seam won’t be visible at all. I planned on coving the vinyl about 1” up the van walls so that any major water spills would be directed toward the doors. This coving would be covered by the plywood walls. This meant I had very few visible seams, so rather than make a template, I did a rough cut of the two pieces, and then hacked away at it inside the van. Do a rough cut of the forward piece of vinyl. Place in the van, and then refine your cut, leaving about 2” all around. Squish the vinyl roughly into place, and then trim to within 1” all around. Put some heavy weights on the vinyl to keep it from shifting, and then work on the aft piece of vinyl. Once both pieces are at their final locations, put weights on then on the passenger side to keep them from shifting while you glue down the driver’s side. 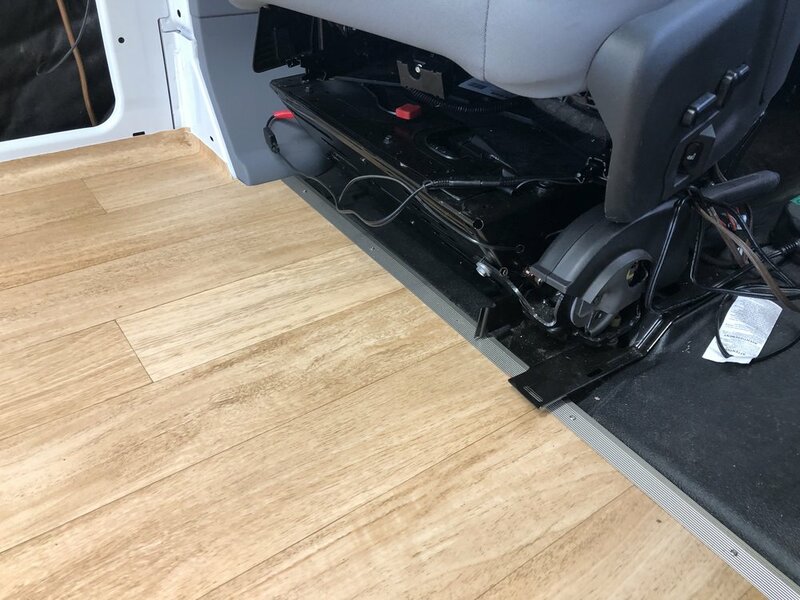 Lift them both away about 2’ from the drivers side of the van, and put down the vinyl adhesive tape along the whole seam, and again lengthwise at 12” and 24”. Roll the vinyl back into place, and then repeat for the passenger side. Seal it up by putting clear silicone caulk in the corners and wherever you might get water moving down underneath. Note: Not using adhesive for the whole sheet is experimental for me. It might be that I get expansion and contraction which would create bubbles or ripples. I don’t think vinyl sheet moves much, but ff this happens I’ll have to inject some glue at the problematic spots. Installing the edging is pretty straightforward. I used my chopsaw with an old blade that did just fine on the aluminum. The sliding door step was all 45 degree angles. The back door trim required each piece to be cut with a 4 degree angle. I fastened them down with 1” #4 truss head screws rather than nails, as I thought nails might work loose, and they are harder to remove if necessary.